Sorry for the lack of posts here, people. With work, physiotherapy (irrelevant story) and family-matters, I’ve barely had time to do anything blog-related for months. I have therefore crammed in as much of my nerdiness from those months here as possible and will pretend that’ll be enough to get any form of forgiveness for my absence. 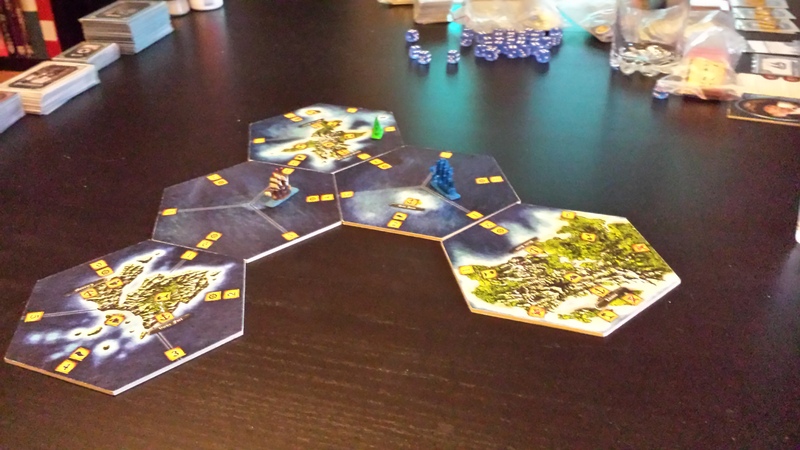 While most people were busy celebrating Easter, I had an object from my bucket list scratched off – I got to attend my first boardgame convention! 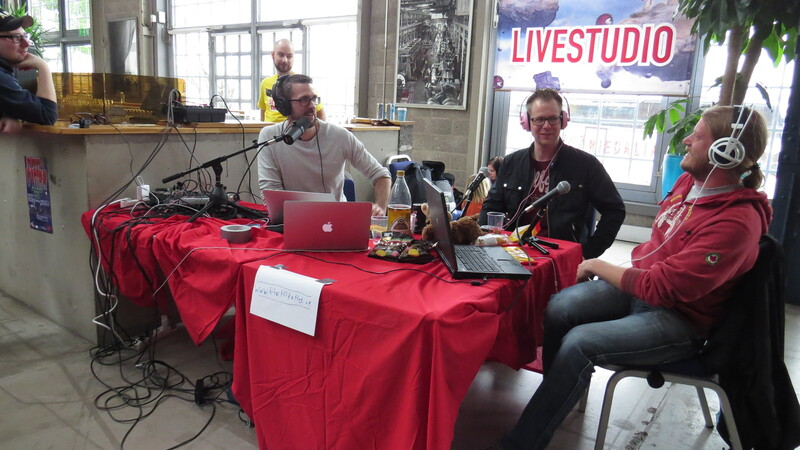 I’ve been dying to go to a convention like this for years and now I’m glad to share my experience of what occurred at this year’s GothCon in Sweden. 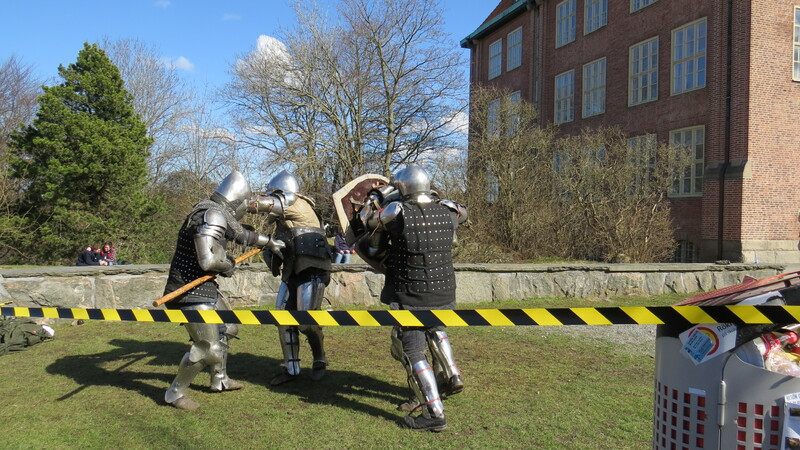 These knights demonstrated their might for people’s amusement. Then my companion for the day arrived and we stepped inside for some fun. We had to take different entrances into the building to get to certain areas. 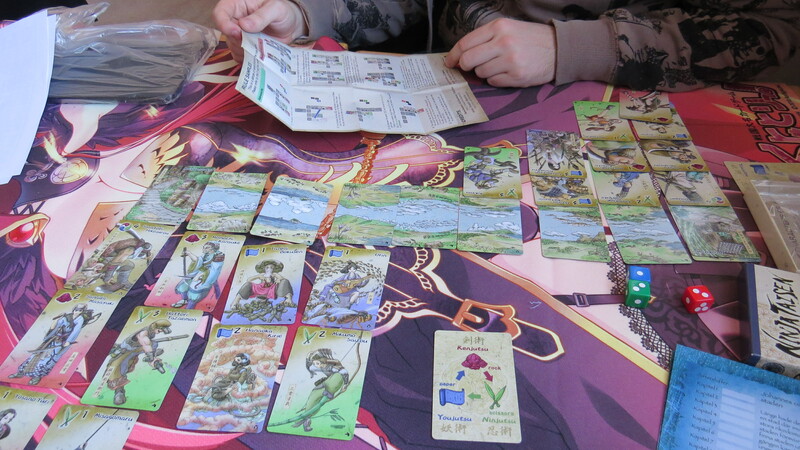 An example of such an area, was the manga/animé-style games, where we got to try out a card game I’ve never seen before. How can you resist a game with the word “ninja” in the title? Before the game began, the players have to set up the cards to create the game field. From what I recall, there was some shuffling involved to select the ninjas for each players “randomly”, but the image below show how the game field looked like in the end. 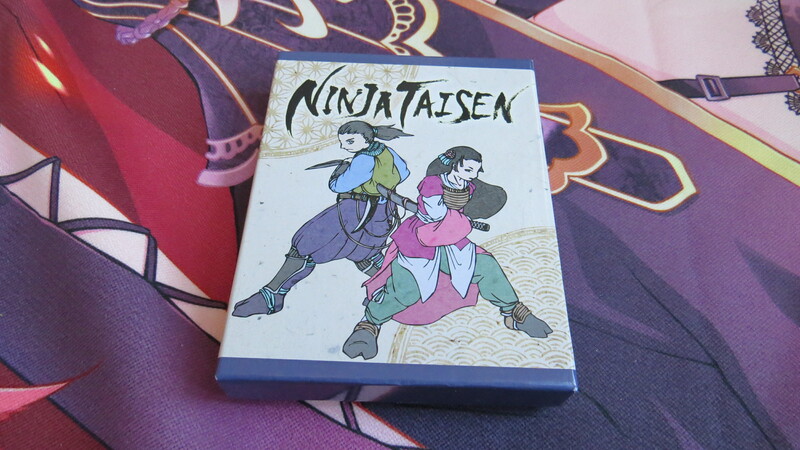 After setting up the river cards between each base card, the ninja cards are placed to guard the way to the other side. Then it was time to get the game started! The first player starts the turn by rolling the three dice. Each dice has a colour that matches the colours of the symbols marked on each ninja and the amount you roll on each dice decides how far you can move a ninja with that colour symbol along with the ninjas below. If the ninjas land on an area where the other player’s ninjas are located, they battle using a rock-paper-scissors kind of system (red = rock, green = scissors and blue = paper) associated with a number that shows how much damage each ninja can deal and take (which comes in handy in case of a draw or if the ninjas meet a boss ninja, which has all 3 colour symbols on the card). When the turn’s over, the second player gets to go through the same process, from rolling the dice to move the ninjas to fight whoever’s in the space they’ve ended up on, as well. Once a ninja reaches the opposing player’s base, the game is over. Ninja Taisen gets a 3/5 from me. The gameplay appears to be simple and easy to learn at first glance, but there were still a lot of things in the game that caused for a lot of confusion. To be honest, I’m not even sure if what I’ve written about the game is accurate enough! 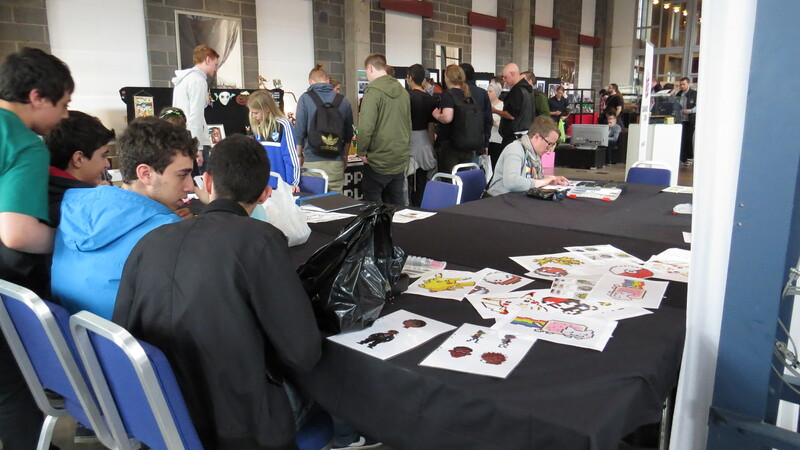 But it was still intreresting to play and had better artwork than most of the Asian-themed games present at the same area at GothCon. My companion for the day and I then moved on to find where the new games were being demonstrated and advertized. We ended up getting stuck at a booth that belonged to the game company Myling Games for a very good reason. 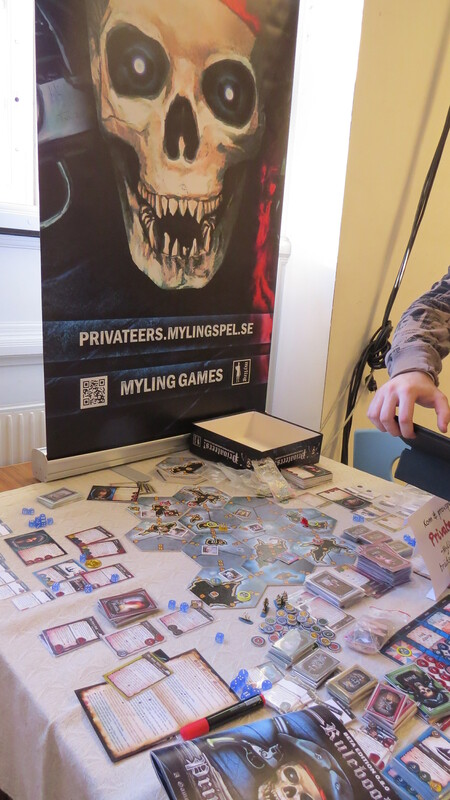 Apart from the many goodies and items they were selling at their huge table, they were also demonstrating a game that we were lucky enough to test – Privateers! (yes, the exclamation mark is included in the name). 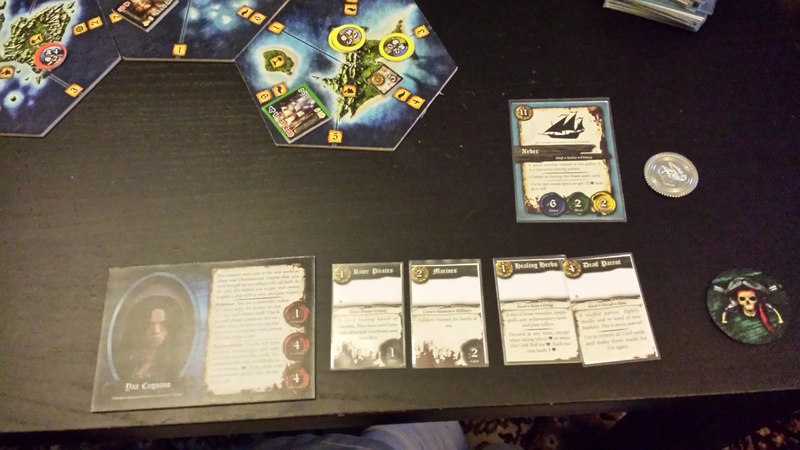 The prototype of Myling Games’ upcoming game, Privateers!. The Player Phase: This is where the players do their things, like move their ships, fight battles, etc. The Enemy Phase: This is when the non-playable characters in the game do their stuff. The Influence Phase: This part was handled by our game leader, so we didn’t get to learn much about this, but it seemed like a part where the scoring was handled after both players and non-playable characters have done their parts. This demo version of Privateers! gets a 3/5. 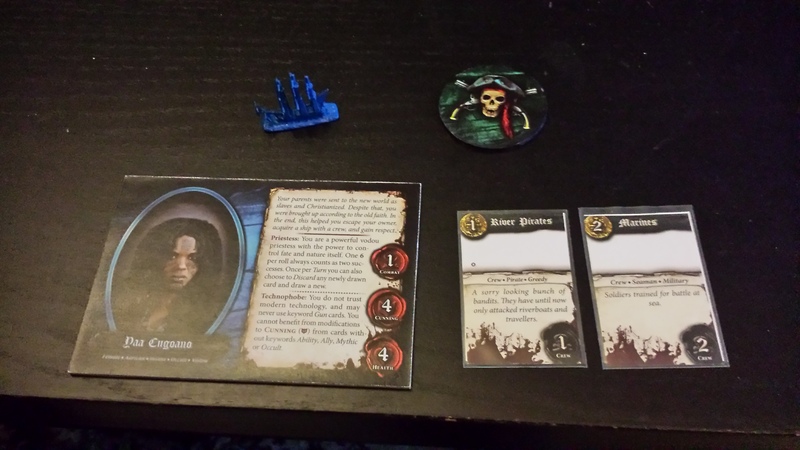 Some of the cards were fun to read and there wasn’t a moment in the game where you didn’t feel like you weren’t in a 17th-18th century piratey world, even if the weird stuff may not always belong to that world (the sense of humour and the subtleness makes up for that, though). 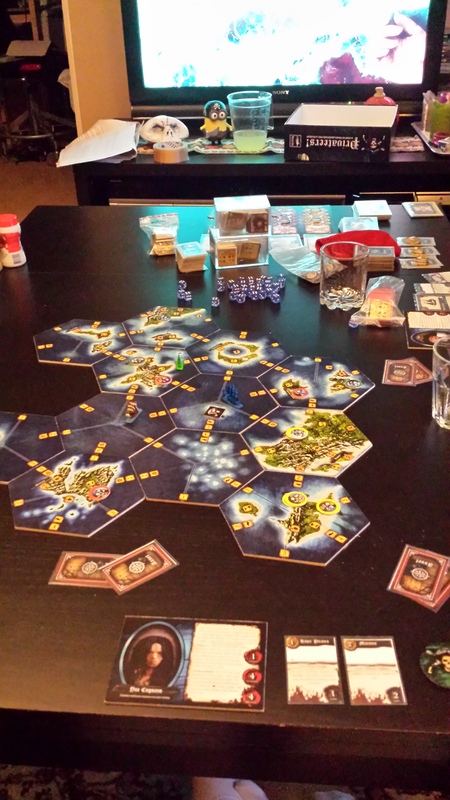 Since the game was still very incomplete and complicated to learn at the time, half of our game time was spent on digging through the rulebook and talking to the game designer for clarification, which took a lot of the fun away. Luckily, Myling Games asked my friend and I for our inputs and advice and promised to take them under consideration for when the game recieves another update. Thankfully, they kept their promise and the rulebook (which you can find as a PDF-file here) has been updated a lot since then. I’ve also been told not long ago that this game has a fundraising campain going on at Kickstarters.com, if anyone wants to help them get the game produced as soon as possible, so I can test the game again and give it a proper rating. Time really flies by fast at these conventions! 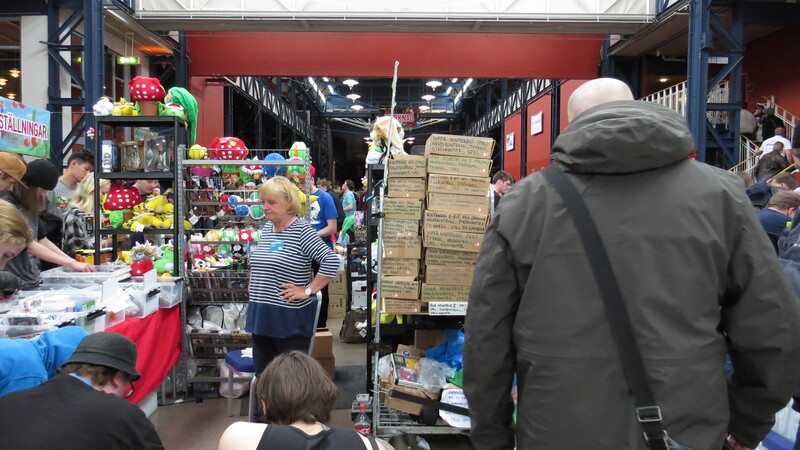 We spent so much time at Myling Games’ booth, we missed out on almost everything else at the convention, like the game auction and a tournament for a Star Wars miniature game. 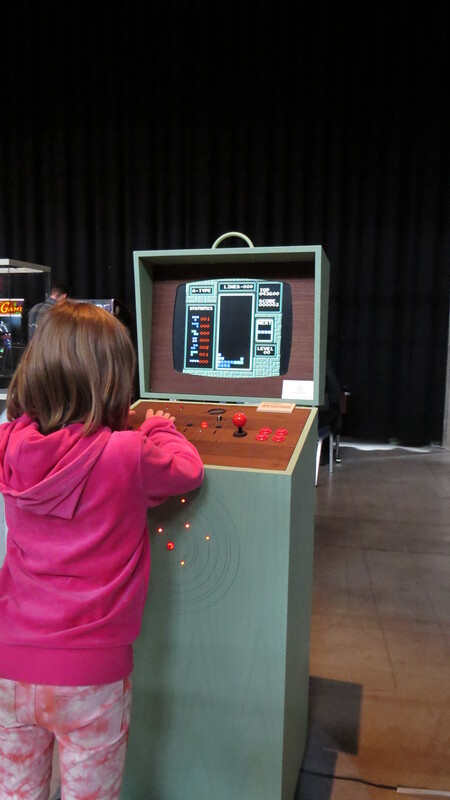 But we did get to try out one more game before we left. 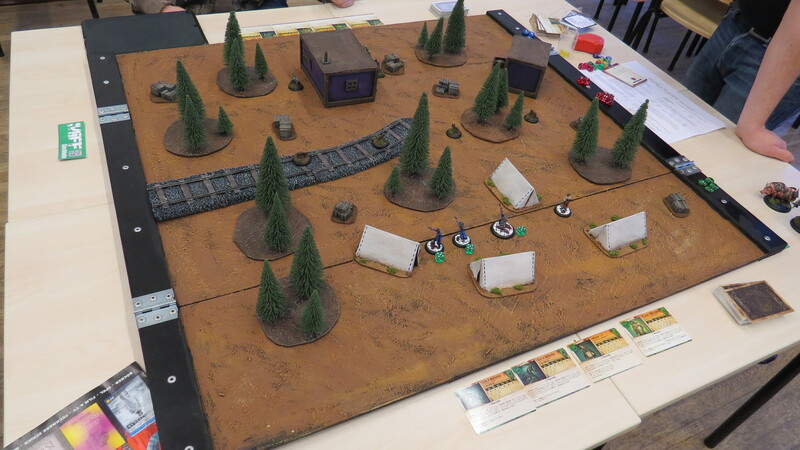 Malifaux, all set-up and ready to play! Those who were young gamers between the 70’s and 90’s know the charm of the old games they grew up playing and don’t hesitate to share the joy with their young, just like young gamers today know how famous old titles are today due to the cult status they hold now and to the sequels to the most popular ones among them are still popping out to the retail market every now and then. Since most of those old gems are getting harder and harder to come by today, it’s a good thing they have conventions for those. 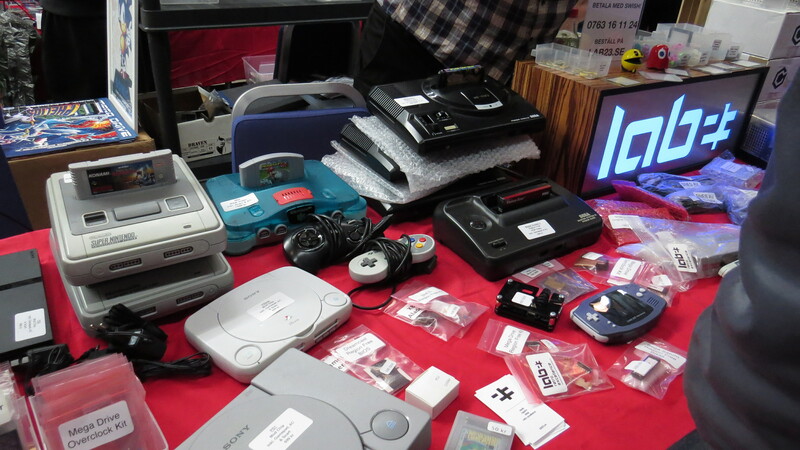 In Sweden, that convention was called Retrospelsmässan (translates to “Retro Game Convention”). If you think no one cares for old games anymore, think again. The line to the convention was so long, it covered an entire block! Thousands of people of all ages stood in line to access the convention, both in and out of costume. Can you see the cosplayer in this photograph? 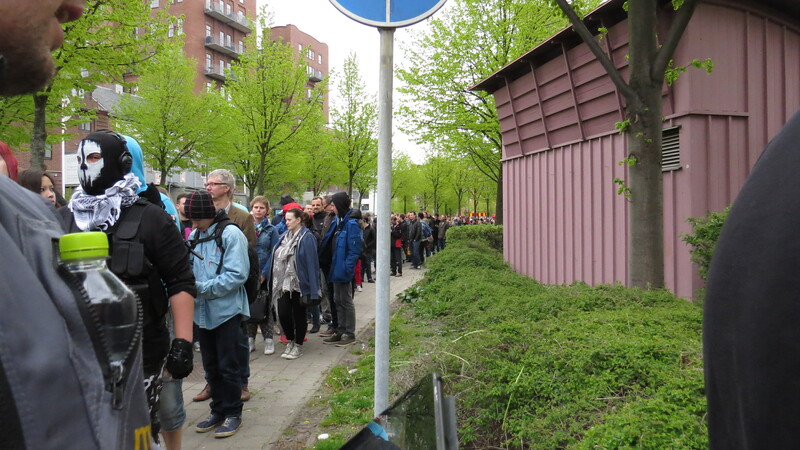 This wasn’t even half the line, just half of the line that formed behind me! People had come from pretty much everywhere to attend this convention. 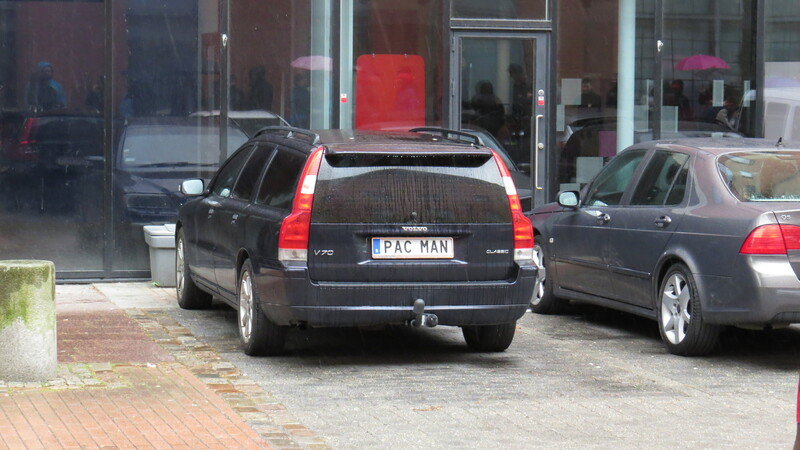 I never saw Pac-Man, but his car was here. 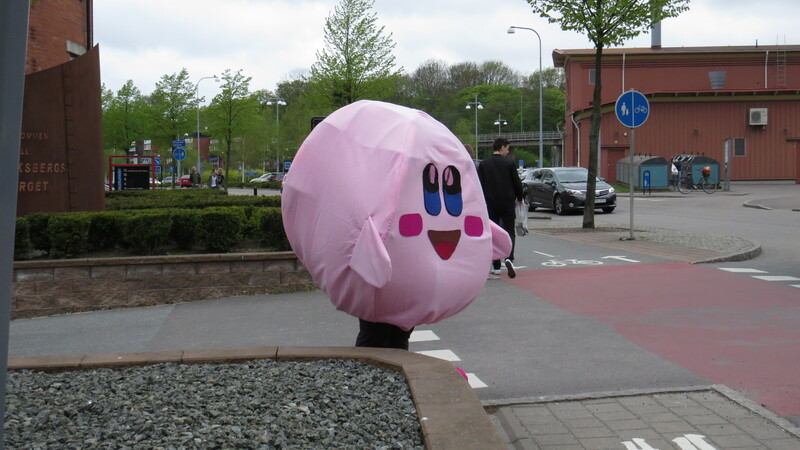 Yup, even Kirby made a short appearance! But eventually, we made it inside the building, where the real fun began right after we paid the entrance fee. The first thing my companion and I discovered, was the kids’ corner. 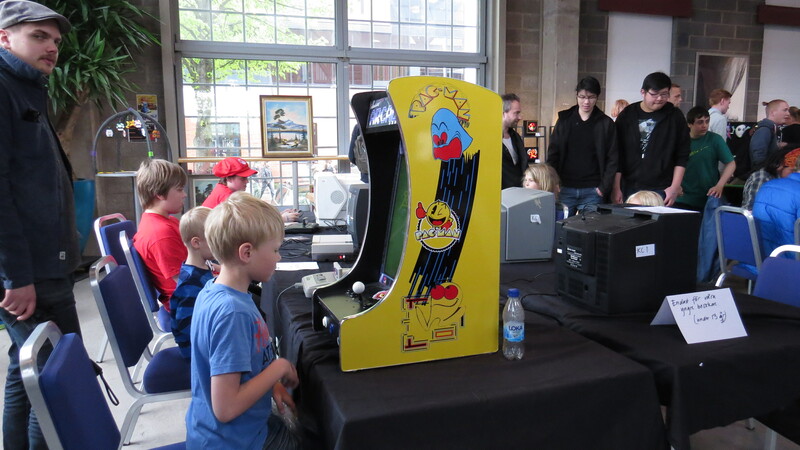 Here, they had set up art stations, game consoles and small arcade machines for them to play with. The kids seems fascinated by the Nintendo consoles and the table version of Pac-Man. In the speakers, event commentators could be heard for a little while. It didn’t take long for them to be spotted either, since their tables were not only close to the children’s corner, but also close to the information desk. When they were done talking, their voices got replaced with some well-known music from various games, like Superfrog and Batman for Nintendo Entertainment System (NES). These gentlemen were chatting away loudly as the first part of the convention was in full swing. Got any questions about the event? Get in line and hope they have the answers you need. The place may have been small, but the booths were many and everyone of them had something for sale or on display. If it wasn’t a modded game console from the 80’s or 90’s or an antique computer in mint condition, the sellers had something tailored done to show off. 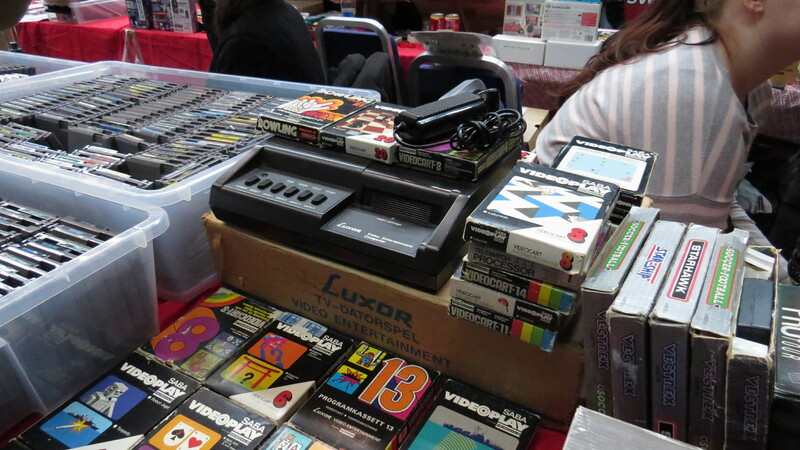 One of several booths, who sold modded game consoles and other used stuff. 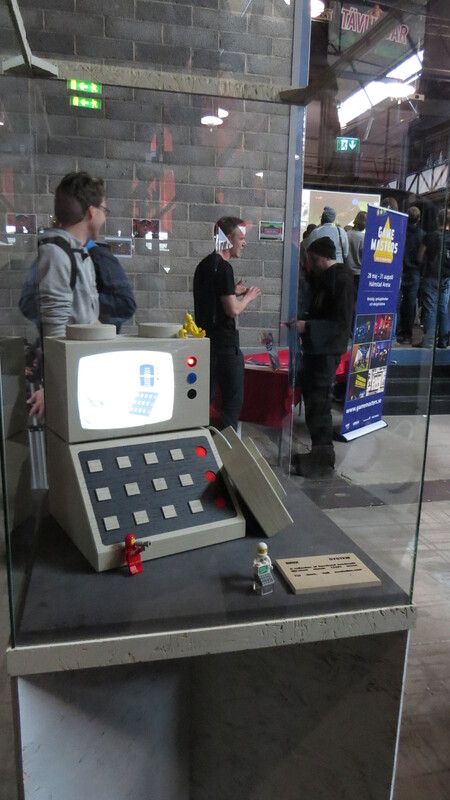 Some modding companies had both modded game consoles AND game consoles that they make themselves! 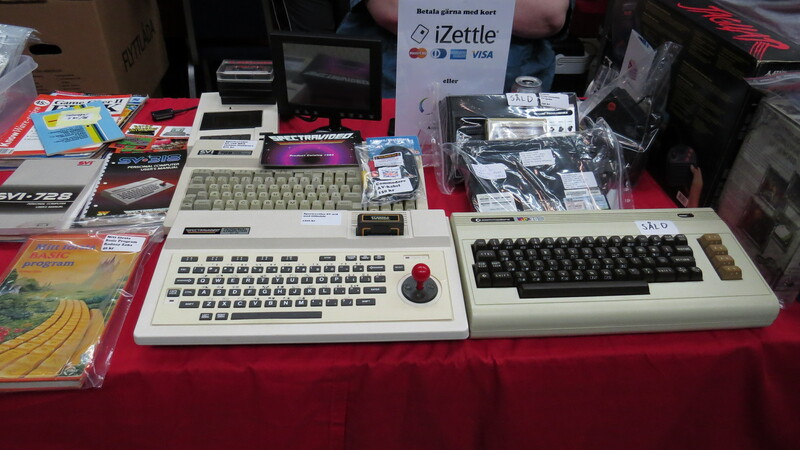 Even old computers, like Commodore VIC-20, were available for purchace! Already have the desired device? Don’t worry, the games for them were being sold there too! 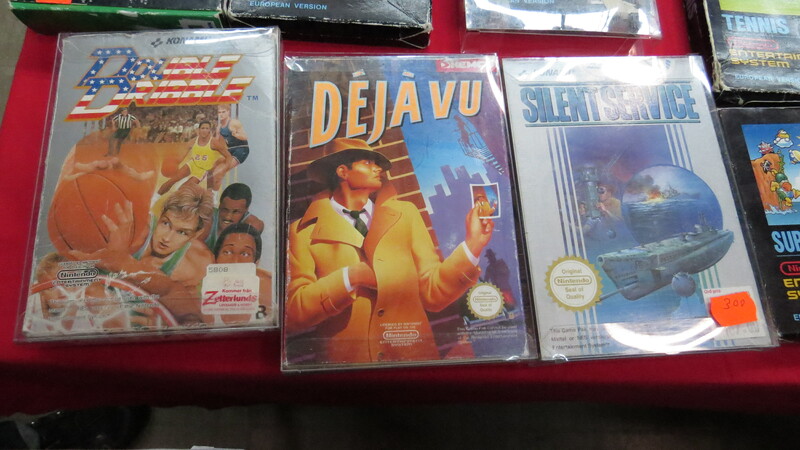 You can really tell the games were played a lot in the past by the quality of the packaging. 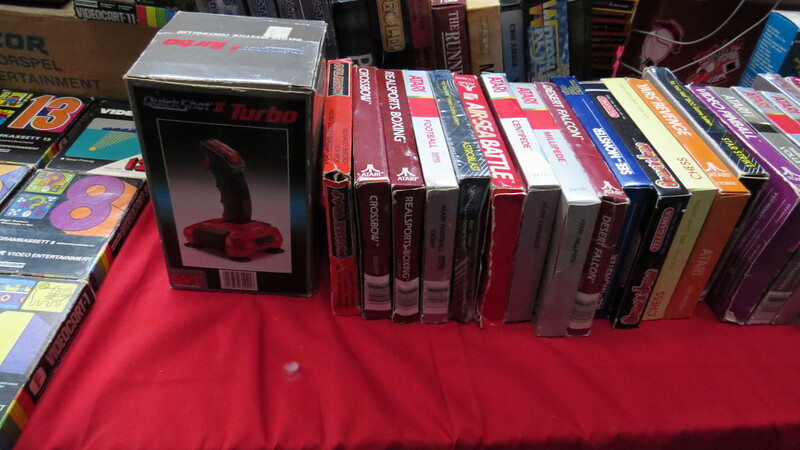 Even these old gems for Nintendo’s consoles were being sold off to whoever grabbed them first! 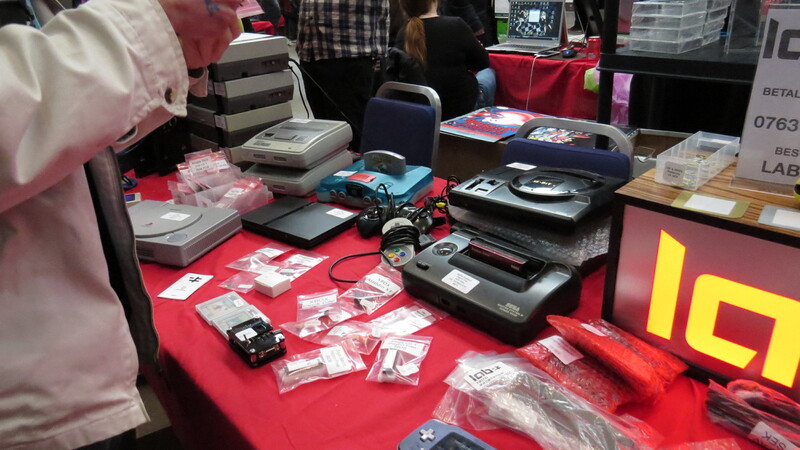 Hardware and software in all their glory, but there were of course more stuff than that for sale! Fan merchandice and spare parts could be found pretty much everywhere, both the real deal and knock-offs. Any sign of your favorite? Parts available for all your assembly-required needs. 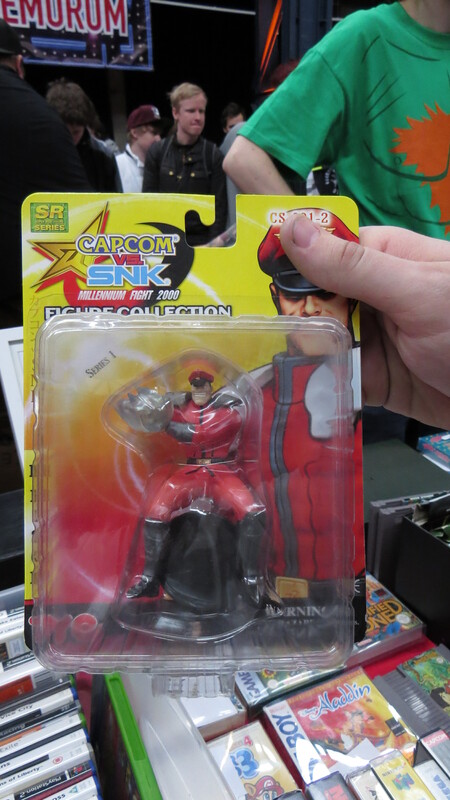 Old figurines and toys of characters from various comics, cartoons and games, like M. Bison here, could be found in their original packaging. But what kind of game convention would this be without something to play and observe? An arcade and exibit area had been set up in a dark corner. A lego computer for humans. An arcade version of Tetris. 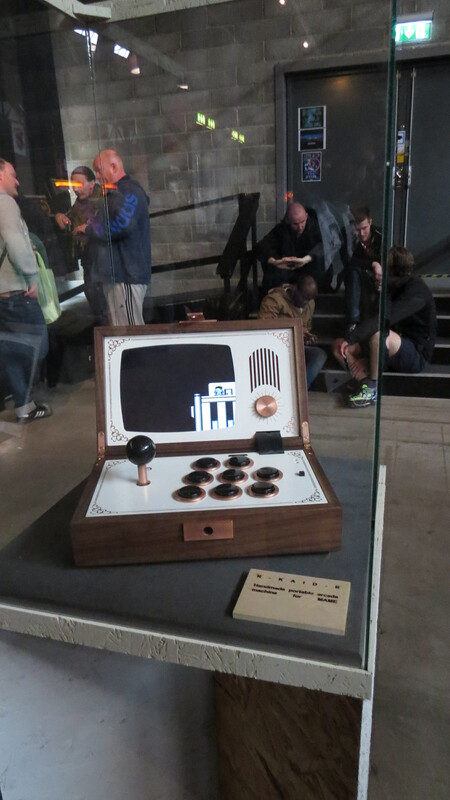 A portable game console – retro style! 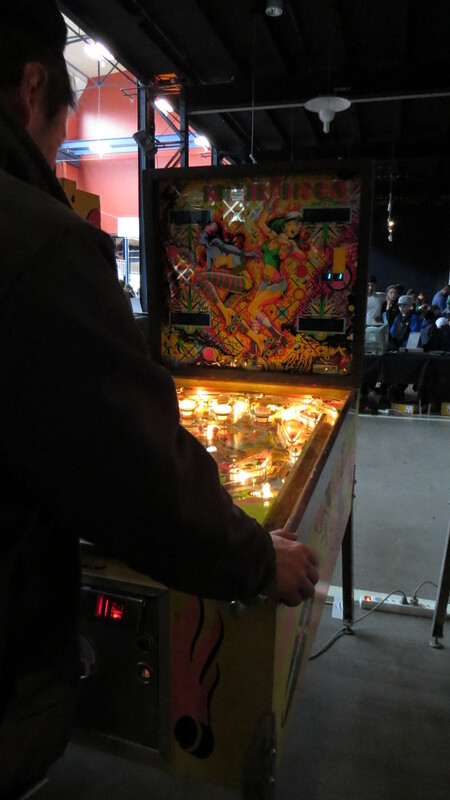 A retro game convention without a pinball game? Blasphemy! 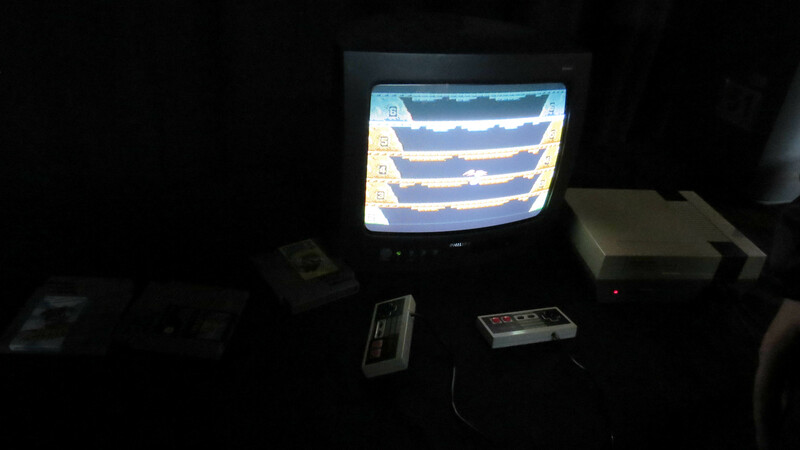 This NES was one of the few consoles set up and ready to play, with a few game cartridges to choose from. And what about the cosplayers? Apart from the few I saw while standing in line outside to get in, several more could be found inside, both hired ones and visiting ones. Most of them vanished as quickly as they appeared, while others popped up a little too much. 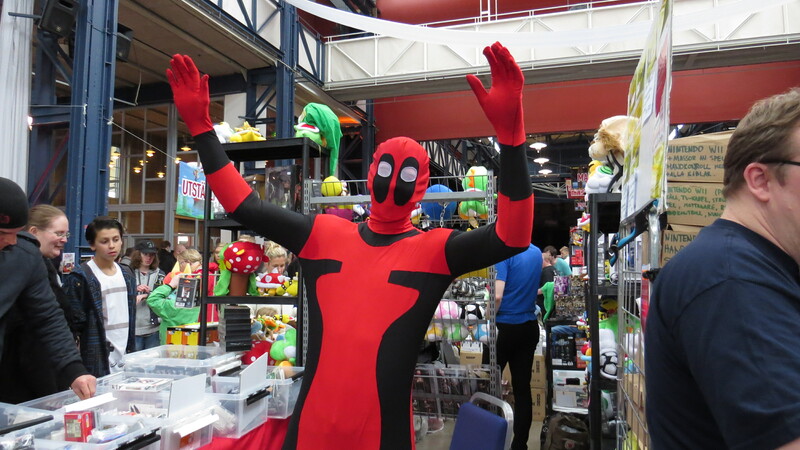 There was also a corner, where a photographer had set up a camera for visiting cosplayers to have their pictures taken in front of a green screen. 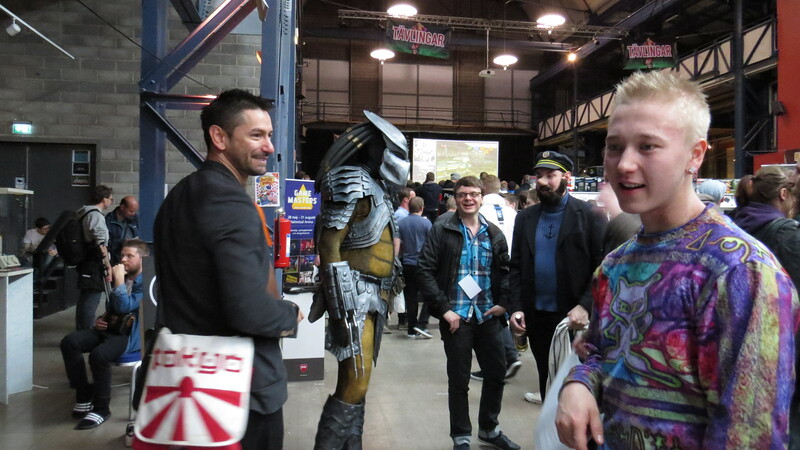 A predator had a chat with Captain Haddock and his friend. Deadpool goofed around a little here and there. 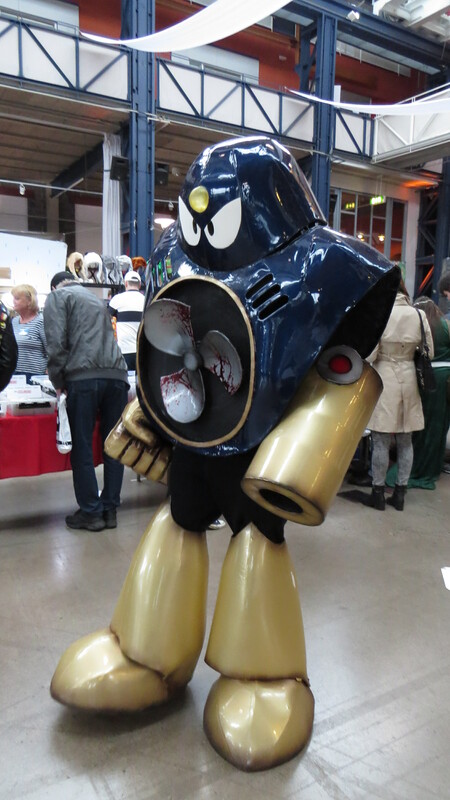 Air Man appeared to be looking for something or someone (Mega Man, maybe?). And last, but not least, a game tournament was in full swing when we arrived and a couple more started later on. 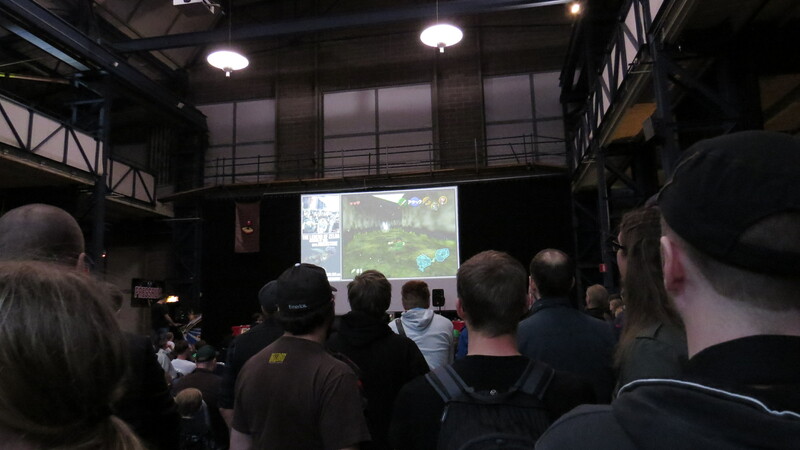 Several games were being played on a large screen at the end on the convention hall. 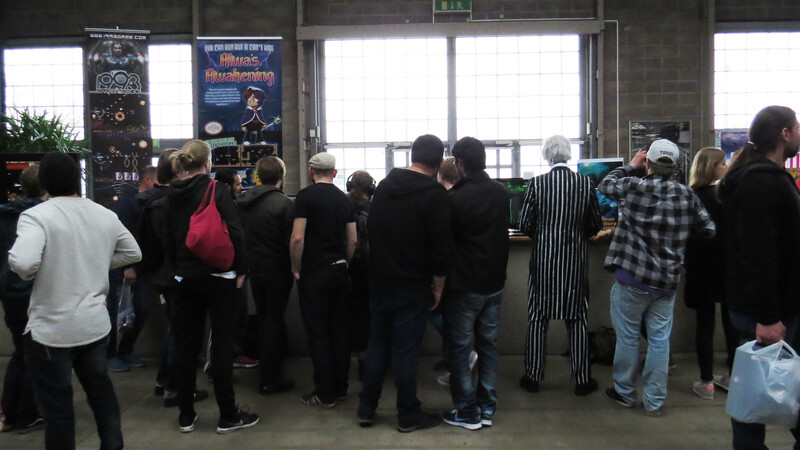 A lot of spectators were watching during the Zelda tournament. 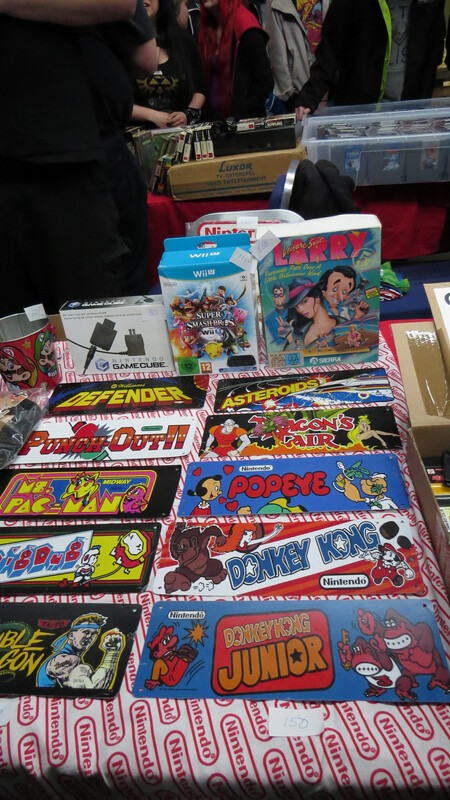 Tags: 2015, Air Man, boardgame, boardgames, Captain Haddock, Commodore, Commodore VIC-20, computer, computers, console games, convention, cosplayer, cosplayers, game consoles, games, GothCon, Malifaux, Myling, Myling Games, Myling Spel, NES, Ninja Taisen, Nintendo, Nintendo Entertainment System, predator, Privateers!, retro, Retrospelsmässan, tournament, Zelda | Permalink.